On the 13th December 2011 at 8pm on Connected 2 Jazz ((13 December 2011 at 8pm), Nigel Vermaas will be paying tribute to the late Zim Ngqawana (25 December 1959 – 10 May 2011). We thought 2010 was a bad year for South African jazz but 2011 seems to be rivalling it. We have already lost Duke Ngcukana, Ernest Mothle and Zim Ngqawana. On his CONNECTED 2 JAZZ show on Bush Radio 89.5 fm on Tuesday 7th June from 8 – 10 pm, Nigel Vermaas will be celebrating the lives of the two Ngcukana Brothers who passed away within 9 months of each other, Ezra and Duke, as well as their father, Christopher Columbus Ngcukana aka Mra. Helping me to remember the family will be the youngest of the brothers, Mfana Ngcukana, musicians Sylvia Mdunyelwa, George Werner and Mark Fransman, as well as writer Sindiwe Magona They all have unique insights into these three strong personalities and enduring artists. We will also feature Zim Ngqawana’s version of YOU THINK YOU KNOW ME, a composition by Mongezi Feza (of the Blue Notes) which became closely identified with Ezra. Zim was a pallbearer at Duke’s funeral. In due course CONNECTED TO JAZZ will honour this jazz giant. Nigel has broadcast documentary-style tributes to a number of our departed jazz heroes including Winston “Mankunku” Ngozi, Miriam Makeba, Johnny Fourie, Alex van Heerden, Robbie Jansen, Gito Baloi and Hotep Idris Galeta. CONNECTED 2 JAZZ can be heard every Tuesday night from 8 – 10 on Bush Radio 89.5 fm. Aside from playing a wide range of jazz, it also attempts to explore the connections between jazz and other music. 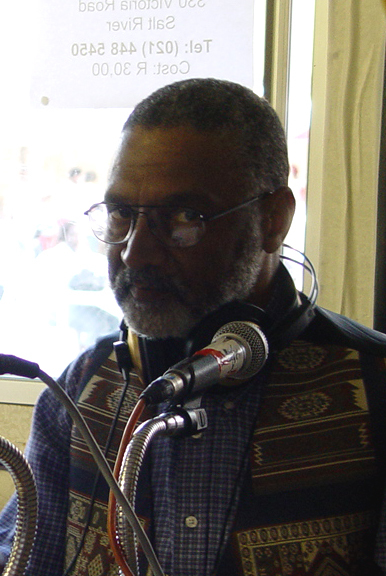 Bush Radio mourns the loss of one of our mentors, teacher and volunteer, Hotep Galeta. Earlier today the Bush Radio newsteam reported that Hotep Galeta passed away at his home. Boeta Hotep, as many at the station knew him, played an important role in developing some of the stations jazz programmes and also assisted with developing projects that used music to help with education and healing. The volunteers, staff and board of Bush Radio would like to send our condolenscences to his family, friends and colleagues.